Pasighat in East Siang district of Arunachal Pradesh will get commercial flight services from May 21. Alliance Air’s inaugural flight from Guwahati will land at the Pasighat airport at 12.20 pm and will take off for Guwahati at 2 pm. The time distance for this flight will be 1 hour 20 minutes flight from Guwahati’s LGB Airport and will be the first commercial flight services from Arunachal Pradesh. 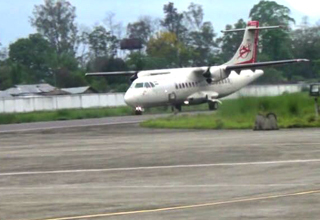 Deputy Commissioner of East Siang district, Tamiyo Tatak, mentioned that the commercial flight from Pasighat ALG will operate three times a week, in a circular. The same flight will connect Kolkata with Pasighat via Guwahati. Alliance Air, will operated the filght services on Tuesday, Thursday and Saturday. The flight route will be Kolkata-Guwahati-Pasighat-Guwahati-Kolkata, reports The News Mill. Arrival time at Pasighat will be 9.05 am while the departure will be 9.25am from May 22. Tickets for the inaugural flights will be Rs 4619 while the return tickets will beRs 2495. Tickets from Pasighat to Guwahati will cost around Rs 1645 for July19. People can buy tickets for the flight here.